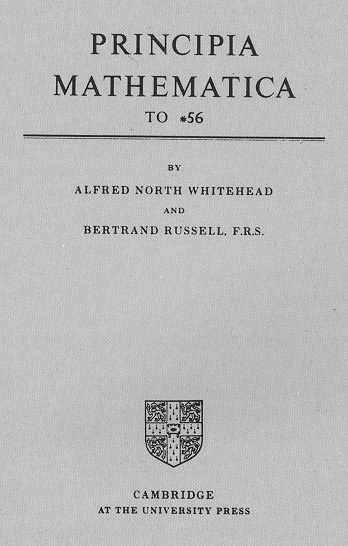 Principia Mathematica, by Alfred North Whitehead and Bertrand Russell, c. 1913. Yet his self-estimation stalls at "R" and "Q," precisely the letters most often used in symbolic logic, a system which became the basis for early twentieth-century analytic philosophy, producing offshoots in works such as Bertrand Russell and A.N. Whitehead's monumental Principia Mathematica (1913). Woolf's representation of an alphabet-obsessed Mr. Ramsay may suggest his adherence to an austere, Platonic philosophy ("think of a kitchen table when you're not there"; reminiscent of the 18th c. theories of George Berkeley) -- rather than empiricism or experience. Cover of Principia Mathematica, Cambridge University Press, c. 1913, via Wikimedia Commons.